Years ago my feathers got ruffled when I read an article arguing Kundry leaves an insignificant impact in Wagner's Parsifal. He stated incorrectly Kundry's only lines are in Act 2 "and even then limited," and suggested it doesn't even matter WHO sings Kundry, and expressed wonder as to why any singer with a major career would take on this unrewarding role. Of course, Kundry being one of the characters I find the most fascinating in the world of opera, I nearly fell from my chair and responded with my having heard seen and/or heard (live or on recording) Kundry sung by the likes of Maria Callas, Christa Ludwig, Martha Modl, Jessye Norman, Tatiana Troyanos, Angela Denoke, Catherine Malfitano, Waltraut Meier, Renata Scotto, Rita Gorr, Leonie Rysanek, Irene Dalis, Violetta Urmana, Regine Crespin, Linda Watson, Katarina Dalayman, Petra Lang, Eva Randova, Yvonne Minton, Michelle DeYoung, Anne Gjevang, Gillian Knight, Gwyneth Jones. Evidence enough of the role's power to attract a widely diverse roster of celebrated singers. I can think of few characters more fascinating, more troubling, more perplexing and ultimately more touching, than Wagner's hybrid distillation of several of the Grail myths more interesting females. Wagner seems to have carved this fascinating creature from von Eschenbach, Chretien de Troyes, and God only knows who else. 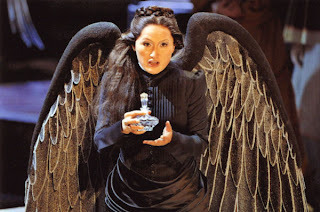 Von Eschenbach describes her as "a woman so talented that she spoke all languages: Latin, Heathen and French . . . familiar with both dialectic and geometry; and she haad also knowledge of astrononomy . . . (her) nickname the sorceress. Her mouth was not restrained for she could say quite enough (and) with it she dampened much joy." That's our gal! In each act Kundry seems not only transformed, but is transforming right before us! 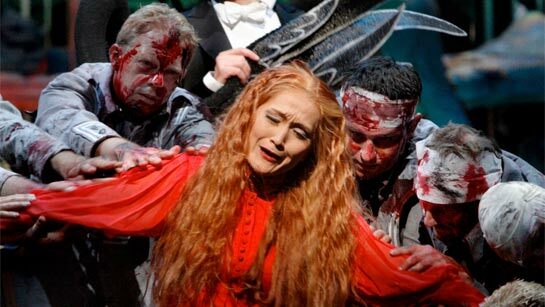 What a gift Wagner has given the singer of this role . and what a marvelous challenge! In Act 1, we're presented with this mysterious, wild woman of dubious character, which in no way prepares us for the seductress we're introduced to in the second act. Even then, we continue to witness her pain and the torture she's endured throughout the entire act. Many operatic characters have screams written into the score, but, for me, none is more chilling than the moans and screams of Kundry, because we're witnessing the ultimate horror; someone realizing they are still alive, when that is the last thing they want to be. 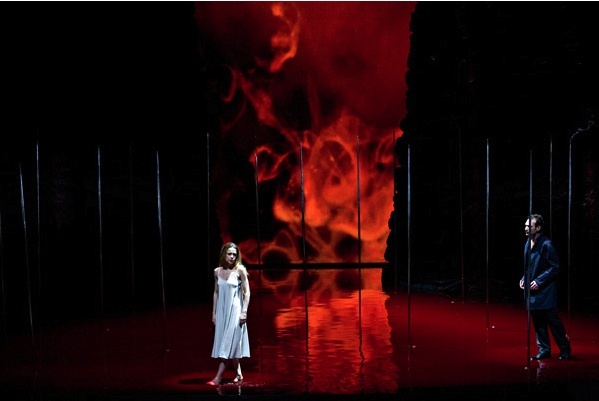 Kundry's second meeting with Parsifal is one of the most fascinating scenes in all of opera. Beginning with "Parsifal Weile!" what ensues is of such a complex nature that it rattles my mind, this even after spending a lifetime with these characters. Throughout, we see this tortured, conflicted and ultimately cursed woman, helplessly bound to continuing Klingsor's dirty deeds, yet now, touched by this innocent fool, she longs for salvation. When she comes clean revealing her thousand year old secrets, she has in a sense found another victim as we witness Parsifal's own confliction, and at the same time, the beginning of an understanding of his place in the world. All of those repeated words present us with a device that, given the right singer, has the potential to shatter an audience as we witness before our eyes (and ears), the Innocent Fool in a profound epiphany of heartstricken terror, pain, realization, understanding, and most importantly of all, empathy. Even as a child, I was drawn to, what my mother would call, "sad stories." I still am, and it's no wonder that my favorite operas are (I believe) amongst the saddest stories set to music: Parsifal, Wozzeck, Pelleas et Melisande, Don Carlos . . . (you get the idea). There's an ineffable sadness to Parsifal that may be the cause of why it alienates so many operalovers. That quality of sadness, instead of pretending pain or ugliness away, instead embraces and reveals along with it . . . everything: not merely joy and good times, which we reflect on in happier states, but all. Alles. I’ve spoken with a number of others who like me, easily declare Parsifal to be their favorite (or one of their favorite) operas, and Kundry to be one of their favorite characters. It truly is one of those "love it/hate it" operas." For me, this magical bit of metaphysics applies not only to the journey at hand, but to the entirety of the opera itself and the world in which its inhabitants find themselves, most pointedly to Kundry who for nearly a thousand years has restlessly roamed from realm-to-realm. Though with only one twice repeated word (“Dienen”) to sing in Act 3, I believe Kundry makes as strong an impression in this act - or has the opportunity so to do - as any the other principals. To be effective the singer, even with only four notes, (and, of course, her entrance groan) must be felt from deep down beneath Kundry's skin. While Act II is where she shines vocally, Act III's two scenes are moving for each of the characters of the story(sans Klingsor). 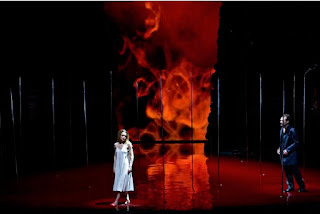 The ordinance of humility and Kundry’s baptism perfectly sets the stage for the second Grail Temple scene, with Wagner's sensational Transformation Music. Here transformation is an apt description not only for what we see occurring onstage, (the shifting from outdoor wilderness to indoor temple) but what we ourselves have witnessed of the characters who likewise have themselves transformed. I've always likened this moment to each having passed through the proverbial refiner's fire: The world weary, tortured Kundry finally finds her rest, the once haughty (and mildly intolerant) Gurnemanz is now the epitome of patience and humility, the hopelessly wounded Amfortas is finally healed, the once Innocent Fool has grown with wisdom and assumes his position as the new Grail King. In only his second Grail Temple experience, Parsifal has attained a level of understanding and awareness previously unimaginable, and the final words expressed by the chorus of Knights, children and the other participants in this moving moment of wonder could not be more profound: The redeemer is redeemed. Many modern audiences (not me) have a problem with many newer productions having Kundry remain a live at the end, but my strongest preference is always to allow her to die. On the opposite end of the stick I know many who despise Wagner's stage direction "Kundry sinks silently to the ground" calling it a Victorian or puritanical "judgment." This train of thought I simply can’t agree with seeing it this way: release is what all Kundry has longed for (far long before we meet her). She's earned it, and Wagner's score, shimmering, shining and filled with the resolution of a long hoped for freedom, provides us with every indication her suffering is now at an end and Kundry is, at long last, finally at peace. It remains amazing to me how Wagner's music ever matches this bizarre, complex bizzare twist of a tale with equal parts carnality, rage, torment and hope filling it with some of his most beguiling music. Yet, more amazing still is when I'm caught up in it, I often forget I'm even listening to music at all, such is the total effect that I feel almost as though I've entered someone else's reality. Wagner’s final work is so powerful even just writing, thinking, or talking about it can put tears in my eyes and make my blood run just a bit faster. Enthüllet den Gral! Öffnet den Schrein! David Gordon Green's "Joe" - Cage is the man.